Remember Lincoln? Ford's high end division used to be out front - whether as luxury limo-type vehicles such as the Continental, "hot rods" of song, and even the original 1960's TV Batmobile, which was really a Lincoln under the skin. Whatever happened? Lincoln is still around, but today their vehicles are basically gussied up Fords - not that there's anything inherently wrong with that. But it seems to me that the high end vehicles should be the state-of-the-art ones, with their stuff trickling down to their lesser brands. This is how companies like Lexus have done it traditionally - stuff that began life on the top line vehicles, even such currently "pedestrian" features such as traction control, ABS and airbags, have made their way down the market and can now be found on the "lowly" Toyotas. Ford may be looking at changing this reverse trickle down thing, starting with the upcoming Continental that looks very interesting indeed, but in the meantime we have vehicles such as the MKZ that's under discussion here. At heart, it's a Fusion - again, not that there's anything wrong with that - that has been, well, enhanced. And it's enhanced very nicely for the most part. It also drives surprisingly well. I took Lincoln Canada's sample MKZ "Reserve" AWD from Ajax, Ontario, to Ottawa and down to Windsor and back and, other than some annoying things about it, I really enjoyed driving it. Let's start with the exterior, which up front is much improved from the previous version with its "Hercule Poirot-like" upturned moustache grille. The new nose is more straightforward and classy rather than weird. I wish I could say the same about the MKZ's rear end, but its slender LED light bar in a sea of metal is the car's weakest link. Still, beauty is obviously in the eye of the beholder and some of the folks with whom I interacted during my time with the MKZ though it was very attractive. Shows what they know! One thing that differentiates the MKZ from the Fusion is its three litre, turbocharged V6 engine, which is a really nice unit. Lincoln Canada's website says it's "projected" to put out 400/400 hp/torque, which is outstanding - and having driven the car on twisty back roads and snore-inducing divided highways I can say that even if the output doesn't reach that "projection," it's still plenty. I had no issues with passing vehicles when necessary, even on the twisty and narrow back roads; the engine's prodigious output made it easy and confidence-inspiring. That marvelous engine is a $4,500 option, unfortunately, but it's a more worthwhile expenditure than some of the sample's other options - such as the $1100 Revel Premium Audio system I really didn't think much of at all. Heck, I turned its bass all the way down and still found the system too boomy. I'd suggest putting that money into the engine and listening to its music instead! Or perhaps you could try the upgraded, upgraded Revel audio system, which adds $4,400. I'd want to hear it before I ticked that particular box, though, thanks to the "base" Revel system being such a disappointment. The base engine for the MKZ is a two litre, direct injection and turbocharged unit and it's undoubtedly adequate for most needs. I can't imagine it would be nearly as exhilarating as the V6, though. Power gets to all four wheels via a nicely shifting six speed automatic with, fortunately, paddle shifters that came in really handy on the abovementioned serpentine back roads. Shifts are very smooth and, though the paddles aren't the quickest to react compared with some other cars I've driven, they performed better than I expected. Especially in Sport mode, which removed any traces of wallow and replaced them with a nearly cat-like manner. In short (okay, maybe that ship has sailed…), it drives really well. 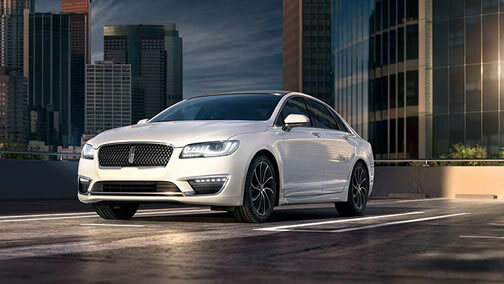 Lincoln credits its "Lincoln Drive Control" for the compelling ride, saying on its website "this suite of drive-enhancing technologies includes continuously controlled damping (CCD) that…uses an advanced suite of sensors to monitor the vehicle's suspension, movement, steering and braking. With this data, the system adjusts the suspension within milliseconds." I don't understand all the technical stuff but I can't argue with the result. Also enhancing the drive on Lincoln's sample was the optional "Driver's Package" ($3,400), which combines dynamic torque vectoring, a sport-tuned suspension and tweaks the continuously controlled damping. It also adds a different grille, 19 inch wheels and painted brake calipers, a unique interior theme and multi-contour seats. Another plus that's available for the MKZ is a beautiful panoramic sunroof, as long as you don't open it. Even when closed it gives you a beautiful look at what's above you (not much, in Southern Ontario, but plenty in the mountains!) but when you open it it slides back over the rear window, blocking a lot of your view. To be fair, Lincoln isn't the only marque that's done this - the last generation of Porsche's 911 Targa suffered from the same issue - but despite the wonderful opening above you the loss of rear visibility is still annoying. The front seats of Lincoln's sample also featured massaging capability that I appreciated very much during a long drive from Ottawa to the Windsor area. I'd fire it up every couple of hours and it helped remove the miles from my posterior. If only it could do that with fat! Shifting the MKZ is accomplished by a row of buttons mounted vertically on the driver's side of the centre stack, just below the Start/Stop button. It works fine, but more than once I meant to put it into Park and hit the Start/Stop instead. The infotainment system works fine and offers all the features you'd want. I had issues with the voice recognition, especially when it came to setting a destination in the navigation system, but it wasn't any worse than many other vehicles' voice systems. They're getting better, but there's still a way to go - and I can't imagine how such systems would work if you happen to speak with an accent. Lincoln's sample also included the Technology Package ($2,450), which includes adaptive cruise control (that works very well) and collision mitigation with stop-and-go. It also includes Enhanced Active Park Assist System, Lane Keeping System, Forward Sensing System, Rain-Sensing Wipers and Windshield wiper de-icer. I shut off the lane keeping system because these things drive me nuts, and was pleased to see that it stayed off upon subsequent startups. Alas, the MKZ's electronics suffered from gremlins. Within five minutes of my leaving Ajax for Ottawa, the centre stack's LCD got stuck on the seat adjustments screen, making it difficult to do anything else that was controlled by the screen, including finding radio stations. I pulled off at the first service centre, shut off the car and opened and shut the doors in an attempt at rebooting the MKZ and it worked - and the system performed flawlessly from then on. Still, one would expect fewer issues with a car whose as-tested price was a whopping $61,000. Then there's that whopping $61,000. Sure, you get a lot of Lincoln for that, and even though it's nicer than a Fusion its DNA is still Fusion-based rather than the other way around. And for that price you're paying for a Fusion platform, if you're shopping around, you can also get a base BMW 528i xDrive (though with a four cylinder engine and only 241 hp), while a base Audi A6 is only about four grand more. Lexus' GS 350 AWD starts at $57,900, while Mercedes-Benz' new E class starts at just over $61,000 and Jaguar's awesome XF can be had starting at $60,000. None of these cars has the awesome horsepower and torque of the MKZ's V6, of course, but if oomph isn't the be-all and end-all for you, they're also worth a look. In the meantime, I can't wait to see the new Continental has in store, and how (or if) that'll trickle down to the fest of the Lincoln and Ford line.